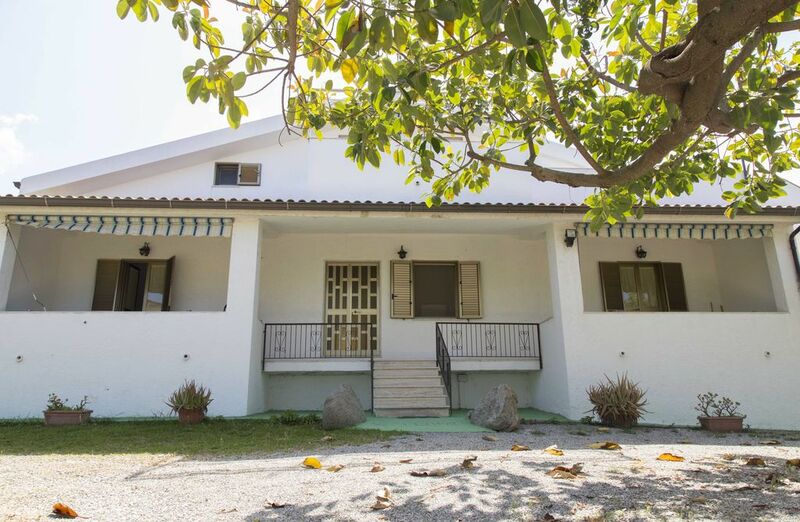 (Text automatically translated) Villa Patricia is located on the coast at about 300m from the sea, in a context that allows you to visit the beautiful beaches, white sand that is on the rocks, moving very little. The villa is surrounded by a large garden shaded by trees, ideal for a holiday of peace and tranquility. Inside there are all the amenities, a wood-burning oven, barbecue, laundromat be used by all guests. The apartment consists of 2 bedrooms, kitchen, bathroom and large living room has a veranda and awnings. Are not included in the price bed linen hired on the spot ? 7 per person and towels rentable on ? 7 per person. Final cleaning ? 30. Inside the villa there are places open also for pets. At about 250m there is the Church of Our Lady of Loreto, where you can listen to the Holy Mass and visit, also, bar, market and restaurants. 1.5 km lies the promontory of Capo Vaticano, where Giuseppe Berto established his residence, and is located approximately 7km Tropea, the pearl of Calabria, also reachable by public transport. "The house and the garden is nice." "UN CONTESTO BELLISSIMO PER TRASCORRERE VACANZE IN SERENITà, SOPRATTUTTO PER GRUPPI NUMEROSI. I PROPRIETARI SONO PERSONE SQUISITE E MOLTO CORDIALI (COME TUTTI I CALABRESI). PARCHEGGI A PAGAMENTO OVUNQUE, ACCESSI AL MARE PIUTTOSTO OSTICI, ZONE DI RISPETTO AL MARE DELLE ABITAZIONI PRATICAMENTE INESISTENTI, SERVIZIO DI NETTEZZA URBANA INADEGUATO." "casa veramente grande e pulita.. proprietari gentilissimi e posto fantastico.. consiglio vivamente"
"L' appartamento è splendido! I proprietari sono cordiali e molto disponibili nel venire incontro ad ogni esigenza degli affittuari. La casa è dotata di ogni comfort, molto grande e comoda. Il giardino attorno è tranquillo e dotato anche di barbecue per gustose grigliate. Il mare ha un colore da tropici, l' unico neo è che la spiaggia dovrebbe essere più curata. Il paese è in salita, quindi è meglio dotarsi sempre di autovettura per raggiungere la spiaggia. Parecchi i siti di interesse turistico nelle vicinanze, raggiungibili sempre in macchina. E' la casa ideale per rilassarsi e godersi l' estate." "L'appartamento è ben curato, i proprietari disponibili e gentili a venir incontro alle nostre esigenze o piccoli inconvenienti. Sicuramente ci ritorneremmo." (Text automatically translated) To reach Villa Patricia in car: motorway exit Pizzo Calabro, follow signs to Tropea - Capo Vaticano. (Text automatically translated) The area of ? ?Capo Vaticano, in addition to 'enchanting landscape and to various beaches surrounded by nature, offers the chance to taste the specialties of the region of Calabria, with a tasting of locally produced red onion, small shops with souvenirs and local crafts . Do not miss a visit to the beautiful Tropea with its villages and beautifull island with the shrine of Our Lady of Romania. E 'can also make excursions into serrese, where he missed a visit to the ancient ironworks and the Charterhouse of Serra San Bruno, "is the obligatory visit to the Aeolian Islands, which can be reached by motorboat departing daily from the nearby beach caves.